The gold mineralization in the Longtoushan hydrothermal gold deposit is concentrated within the contact zone of the granitic complex. 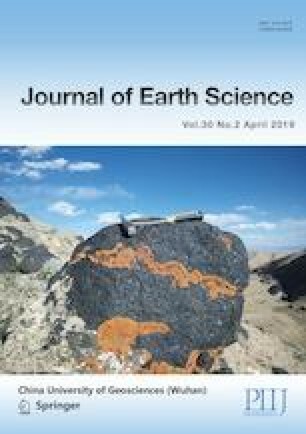 Whole rock geochemistry and in-situ U-Pb and Hf isotopic data were used to constrain the genesis and age of the granites and related Cu-Au mineralization in the Longtoushan Deposit. The granites mainly consist of the granite porphyry, rhyolite porphyry, porphyritic granite and quartz porphyry. LA-ICP-MS U-Pb dating of zircons from the granite porphyry, rhyolite porphyry and quartz porphyry indicates that they intruded from ca. 94 to 97 Ma. These intrusions exhibit similar trace element characteristics, i.e., right-dipping REE patterns, depletion of Ba, Sr, P and Ti, and enrichment of Th, U, Nd, Zr and Hf. The εHf (t) values of zircons from the granite porphyry, rhyolite porphyry and quartz porphyry range from −26.81 to −8.19, −8.12 to −5.33, and −8.99 to −5.83, respectively, suggesting that they were mainly derived from the partial melting of the Proterozoic crust. The Cu-Au mineralization is mainly related to the rhyolite porphyry and porphyritic granite, respectively. The Longtoushan granites were most likely formed in a post-collisional extensional environment, and the deposit is a part of the Late Yanshanian magmatism related mineralization in the Dayaoshan area and its adjacent areas. Supplementary material is available for this article at https://doi.org/10.1007/s12583-018-1204-7 and is accessible for authorized users. This study was supported by the Project of Innovationdriven Plan in Central South University (No. 2015CX008) and the Fundamental Reserch Funds for the Central Universities of Central South University (No. 2015zzts071). Conggao Liang and Rui Huang are thanked for their invaluable help and support during fieldwork. The U-Pb dating and in situ Hf ratio analyses of the zircons were carried out at Nanjing FocuMS Contract Testing Co. Ltd., with support from Liang Li and Jianfeng Gao. We appreciate two anonymous reviewers, who helped to improve the paper greatly. Moreover, we thank Miao Yu, Quan Ou and Wenzhou Xiao for their constructive reviews and useful suggestions. The final publication is available at Springer via https://doi.org/10.1007/s12583-018-1204-7.